Batch Cooking Plan – Slow Cooker Freezer Packs, Muffins, Cookies and More! But this week, I’m home. And I’m ready to get a few things into the freezer to make dinner prep a little faster and smoother. Mangoes were cheap at Kroger this week ($1 each), bacon was on special at Meijer, and I stocked up on baby carrots from Aldi ($.59/bag!! )…all of which fit perfectly into this week’s batch cooking plan! Plus, my baking cabinet is stocked, and I’ve got a few bananas that are nice and brown from last week…will make for delicious banana bread muffins. My pantry, fridge and freezer are begging for an afternoon of batch cooking. My sanity is also begging for an afternoon of batch cooking. 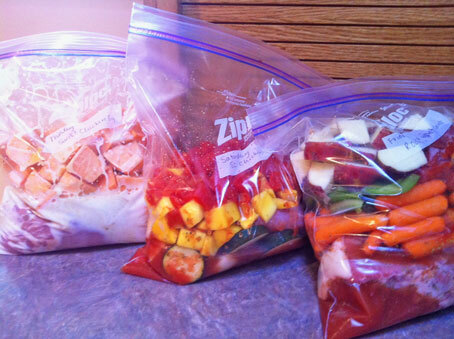 Anyone else stocking their freezer or taking steps to simplify the dinner prep this week? If so, with what and how? Erin – so nice to see you here! I’m looking forward to hear how this goes at the other end – getting used to new grocery stores, building up the stockpile. I go through this fairly frequently (my husband is military) and I would love some help/ideas on getting going faster. Still no luck on the house yet huh? Hopefully families with kids just haven’t started looking till schools out for the summer! I have to say I’m impressed with being down to basically two cabinets of food. Our pantry was looking pretty sparse (as in 2 of 5 shelves were empty) and my family accused me of starving them to death!!! Trying to plan a freezer batch cooking party here with my girlfriends so thanks for the ideas. I think they’ll work great as quick, go to, yet healthy meals for summer. I really want some advice on how to get started….my family does not like crock pot meals cause they are overcooked by the time we get home. I have a side by side fridge/freezer combo and want to freezer cook but don’t know where to begin.